This series of articles provides details about all types of building insulation, identifying each type of insulation. We illustrate and include photographs of insulation materials that would not be expected to contain asbestos as well as asbestos-containing materials. This document assists building buyers, owners or inspectors who need to identify building insulation & those who need to recognize asbestos-containing materials (or probable-asbestos) in buildings by simple visual inspection. On this page we provide an ARTICLE INDEX to RELATED ARTICLES that includes a live link to - a comprehensive list of building insulating materials. 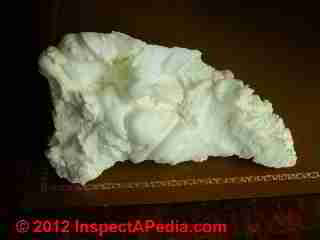 Each of those links provides an individual article with photographs, uses, & properties of that insulating materials. 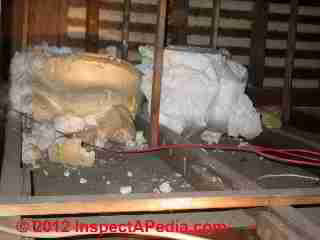 Which building insulation materials do or do not contain asbestos? While an expert lab test using polarized light microscopy may be needed to identify the specific type of asbestos fiber, or to identify the presence of asbestos in air or dust samples, many asbestos-containing building products not only are obvious and easy to recognize. But since there were not other look-alike products that were not asbestos, a visual identification of this material can be virtually a certainty in many cases. ASBESTOS-FREE INSULATION MATERIALS contains our complete list. These non-asbestos insulations include cellulosic insulations such as loose-fill cellulose and balsam wool batts, cotton insulation, fiberglass insulation, mineral wool insulation, slag wool insulation, and rock wool insulation. Above: a common form of asbestos insulation found in older buildings is an asbestos-based corrugated paper insulating wrap used on pipes. See details about actual building insulation made of or contaminated with asbestos, discussed at ASBESTOS BUILDING INSULATION. Also see ASBESTOS PIPE INSULATION - asbestos used on heating or plumbing pipes. see ASBESTOS INSULATION for a complete guide to all forms of asbesto insulation found in or on buildings. "Balsam Wool" is a wood fiber product or "cellulose" insulation that was widely used in homes and in a variety of other applications in the U.S. from at least the 1930's. See BALSAM WOOL BATT INSULATION for details. Brick Infill in Building Walls as "Insulation"
Brick wall "insulation" or brick nogging may be found in wood framed buildings built up to about 1900. Usually these homes have exterior clapboards and interior plaster walls. 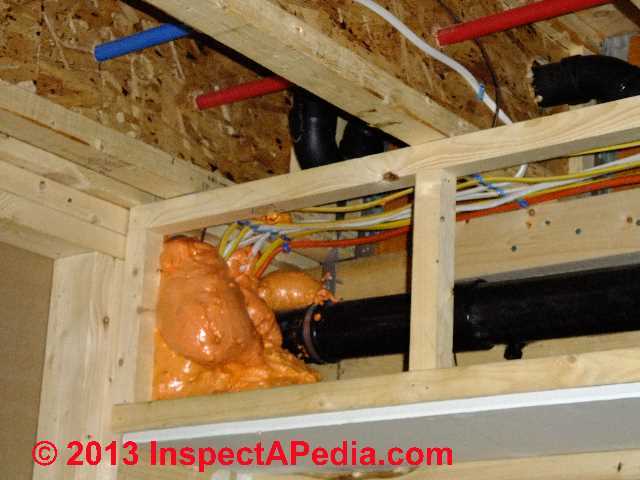 Our photo above is of blown-in cellulose insulation. See CELLULOSE LOOSE FILL INSULATION for details. Our photo above is of cotton batt building insulation. See COTTON INSULATING BATTS for details. Fiberboard insulating sheathing board was used and continues in use as a structural wall sheathing board 15/32-inches thick (one board was 1/2") and with R-value of about 1.5. Fiberboard insulating sheathing was and continues to be made of plant cellulose such as wood fibers, combined with a binder, a water-resistive coating or component (such as paraffin and/or asphalt), and other treatments. at SHEATHING, FIBERBOARD for details about insulating sheathing used on both the exterior (under siding) and interior of buildings. .
Fire-block foam is a fire-resistant foam spray used to seal building floor, wall, or ceiling penetrations, especially in new construction or a spray-foam insulation retrofit job. FOAM SPRAY INSULATION TYPES including both modern sprayed in place foam insulating products (such as ICYNENE FOAM SPRAY INSULATION) and older sprayed UFFI. Our photograph shows icynene spray foam building insulation. and POLYISOCYANURATE FOAM and IAQ for details. Mineral wool is produced by melting rock and slag to produce a mineral fiber that may be aggregated and bound by a resin for use as building insulation. 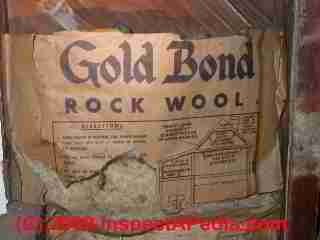 Mineral wool, also called "rock wool" or slag wool or stone wool may be found in buildings as chopped loose-fill insulation, as longer twisted ropy loose fill insulation, or as insulating batts such as the Gold Bond Rock Wool insulating batt shown in our photograph. 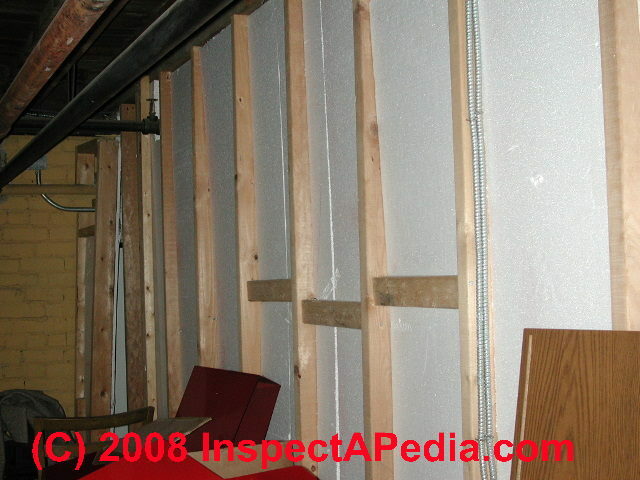 Our photograph shows indoor use of polystyrene foam insulating board on the inside of a basement foundation wall - notice the absence of a suitable fire-resistant covering? This installation probably violates local building codes. Foam insulating boards do not contain asbestos but can present a fire hazard because they give off dense smoke and possibly toxic fumes in a fire. Other older building insulation materials such as corn cobs, newspaper, bricks, and simple reflective barriers using aluminum foil also would not be expected to contain asbestos. 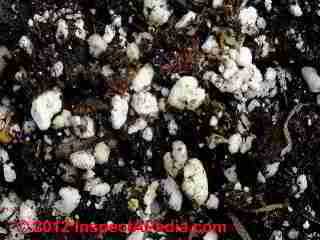 Our photograph shows perlite insulation. See PERLITE INSULATION for details. 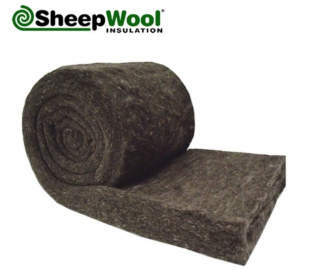 Sheep Wool Insulation Optimal is a range of grey coloured sheep's wool insulation rolls offering high thermal and acoustic. Optimal rolls are suitable for use in floor and ceiling level applications and are available in a variety of convenient dimensions. Optimal Insulation rolls may also be used Vertically as well as horizontally due to their high density, so they can be used also in walls, and sloping ceilings. Please note this product is 100% pure, natural sheeps wool insulation. Optimal is a highly effective insulation roll with a superior thermal performance over glass or mineral wool products. Optimal is made of pure new wool fibres, which hold their shape and thickness right throughout their lifetime. Being produced from 100% pure wool fibres, Optimal is a fully breathable material that will maintain it's thermal efficiency even in the harshest climates. Combustible materials: highly contribution to a fire: Will resist only a small flame attack in the beginning of the fire. SHEEP WOOL FIRE PROTECTION INFORMATION [PDF] op. cit. Starch foam was made already in 1989 as biodegradable packaging, and is an alternative material to the traditional polystyrene foams. Starch is a polysaccharide made up of glucose units linked by glycoside linkages, and its length is generally between 500-2000 repeat units. Starch is made up of amylose and amylopectin Amylose is more linear and gives the foam flexibility and keeps the density low, while amylopectin is highly branced and makes the product more foamable. Starch can be extracted from for example corn or potatoes. Starch foams are produced by extrusion where the starch is melted and mixed with a blowing agent. The blowing agent for starch is often water or methanol, which is turned into steam when the system is heated and forms air bubbles within the starch matrix. Biodegradable foams Biodegradable polymer foams are investigated not only because of the increasing waste and environmental problems for traditional polymer foams, but also because of the increasing price of petroleum products that are used in manufacturing the polymer foams. Biodegradable foams are water soluble and sensitive to humidity, while traditional petroleum-based foams are more inert to water. Biodegradable foams are also limited in making foams that have microcellular structure, which means they will be hard to make into thin sheets. However, they are important in reducing the amount of CO2 emission. There is also a wide range of different candidates of biomaterials that can be used for biodegradable foams, including ethylene vinyl alcohol, polyvinyl alcohol, polycaprolactone, polylactic acid and starch. A short review of historic development from macerated paper introduced in 1919 as a commercial insulation product in Canadian Prairies lead us to the 2009 American production of cellulose fiber batts and blankets and European flexible and rigid wood-fiber thermal insulation boards. A short expansion from the current R/D activities bring us a new world of bio-fiber thermal insulations where different recycled and fresh fibers are mixed and bonded with advanced chemical technology to produce composites for several construction and industrial applications. Our photograph shows indoor use of pink styrofoam insulating board on a basement ceiling. As with the next example just below, this installation violates fire safety & fire codes - in an occupied or occupy-able space it should be covered with a fire-resistant drywall or other acceptable barrier. Tripolymer foam building insulation may be used as building insulation as an alternative to more-widely-used icynene foam. Tripolymer foam, unlike icynene insulation, is a water-soluble foam insulation. Density: 0.8 - 1.3 lbs./cu.ft. Tyrpolymer foam, a product that was manufactured by C.P. Chemical Company, a New York Corporation, and marketed under the name Tripolymer4 105, was installed by injection into the building wall or (enclosed) ceiling cavities. In1986 C.P. Chemical was involved in litigation against the U.S. Consumer Product Safety Commission (CPSC) concerning this insulating material. C.P. Chemical's complaint against the CPSC was dismissed by the court. The suit arose from the Commission's ban on the use of formaldehyde-emitting foam insulation, 47 Fed.Reg. 57,488 (1982). The Fifth Circuit ruled, in Gulf South Insulation v. U.S. Consumer Product Safety Commission, 701 F.2d 1137, 1148-50 (5th Cir. 1983), that the ban was improper because it was promulgated under the procedures of the CPSA, 15 U.S.C. §§ 2057, 2058, 2079(d), rather than under the appropriate procedures of the Federal Hazardous Substances Act, 15 U.S.C. §§ 1261-1276. C.P. Chemical alleged that the Commission erroneously included within the ban its insulation product, Tripolymer 105, which emits no formaldehyde gas. The district court held that the FTCA waiver of sovereign immunity does not extend to the agency conduct forming the basis for this tort action against the United States and the Commission. The court also held that the CPSA provides no predicate for this action. For the reasons stated below, we affirm. C.P. Chemical Company is a family-owned New York corporation that manufactured "Tripolymer 105," a foam insulation product that was mixed on the job site and pumped between a structure's walls. Tripolymer 105, a phenal-urea based product, competed with a similar product--urea-formaldehyde foam insulation ("UFFI"). However, unlike Tripolymer 105, UFFI was found to emit detectable levels of formaldehyde gas. C.P. Chemical Company, along with other foam insulation manufacturers, sought judicial review of the UFFI ban pursuant to 15 U.S.C. § 2060. On April 7, 1983, the Fifth Circuit held that the Commission's rule was not supported by substantial evidence and therefore vacated the ban. Gulf South Insulation v. U.S. Consumer Product Safety Commission, 701 F.2d 1137 (5th Cir. 1983). While expressly declining to address C.P. Chemical's claim that it should have been exempted from the ban because its product was safer than UFFI, 701 F.2d at 1140, the court also held that the Commission had followed the wrong rulemaking procedures when it promulgated the rule under the informal procedures of the Consumer Product Safety Act, 15 U.S.C. §§ 2058, 2079(d). The agency should have proceeded under the Federal Hazardous Substances Act, 15 U.S.C. §§ 1261-1276, which requires a formal hearing wherein rules of evidence are applied and the right to confront and cross-examine witnesses is recognized, 701 F.2d at 1149-50, see 15 U.S.C. § 1262(a) (2). For the reasons stated above, we hold that the district court correctly dismissed the complaint for lack of subject matter jurisdiction and for failure to state a claim. The judgment of the district court is affirmed. Our photograph above shows UFFI building insulation. Our photograph shows Vermiculite building insulation. See VERMICULITE INSULATION for details. Continue reading at FOAM SPRAY INSULATION TYPES or select a topic from closely-related articles below, or see our complete INDEX to RELATED ARTICLES below. 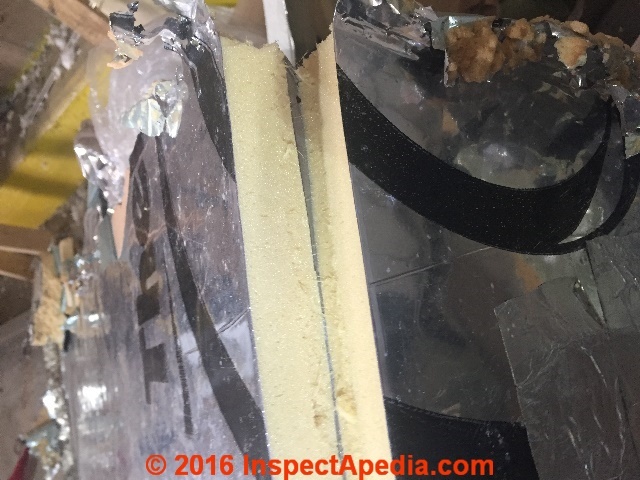 Or see INSULATION INSPECTION & IMPROVEMENT for details about inspecting and improving the level and effectiveness of insulation in buildings, as well as advice on troubleshooting insulation system defects & problems. INSULATION IDENTIFICATION GUIDE at InspectApedia.com - online encyclopedia of building & environmental inspection, testing, diagnosis, repair, & problem prevention advice. Brick Nogging, Historical Investigation and Contemporary Repair, Construction Specifier, April 2006. Historical use of brick in timber-framed buildings, drawing on the investigations of the Kent Tavern in Calais, VT. "Brick nogging is a European method of construction which was brought to the new world in the early-nineteenth century. It was a common construction method that employed masonry as infill between the vertical uprights of wood framing." -- quoting the web article review. Building Research Council, BRC, nee Small Homes Council, SHC, School of Architecture, University of Illinois at Urbana-Champaign, brc.arch.uiuc.edu. "The Small Homes Council (our original name) was organized in 1944 during the war at the request of the President of the University of Illinois to consider the role of the university in meeting the demand for housing in the United States. Soldiers would be coming home after the war and would be needing good low-cost housing. ... In 1993, the Council became part of the School of Architecture, and since then has been known as the School of Architecture-Building Research Council. ... The Council's researchers answered many critical questions that would affect the quality of the nation's housing stock. How could homes be designed and built more efficiently? What kinds of construction and production techniques worked well and which did not? How did people use different kinds of spaces in their homes? "An Example of Colonial Paneling", Norman Morrison Isham, The Metropolitan Museum of Art Bulletin, Vol. 6, No. 5 (May, 1911), pp. 112-116, available by JSTOR. Humidity: What indoor humidity should we maintain in order to avoid a mold problem? Insulation: Selecting Insulation for New Home Construction, U.S. Department of Energy - "Your state and local building codes probably include minimum insulation requirements, but to build an energy-efficient home, you may need or want to exceed them. For maximum energy efficiency, you should also consider the interaction between the insulation and other building components. This is called the whole-house systems design approach." Insulation Types, table of common building insulation properties from U.S. DOE. Readers should see INSULATION R-VALUES & PROPERTIES our own table of insulation properties that includes links to articles describing each insulation material in more detail. Nogging: See this photo of exposed bricks on a building exterior On a building exterior in Canada. [Thanks to Carson Dunlop, Toronto - see References below]. Piquet Wall Construction: See this photo of piquet wall construction - involving timber-framed wall construction with long top girts, diagonal timber bracing, and small diameter logs placed vertically along with concrete chinking to fill in the wall plane. 06/12/2007 documented at yurokplankhouse.com where scale model Museum quality Yurok Plank Houses are being sold to raise money for the Blue Creek - Ah Pah Traditional Yurok Village project. Rubblestone Wall Filler: See this Lartigue House using exterior-exposed rubblestone filler between vertical timbers of a post and beam-framed Canadian building. Weaver: Beaver Board and Upson Board: Beaver Board and Upson Board: History and Conservation of Early Wallboard, Shelby Weaver, APT Bulletin, Vol. 28, No. 2/3 (1997), pp. 71-78, Association for Preservation Technology International (APT), available online at JSTOR.